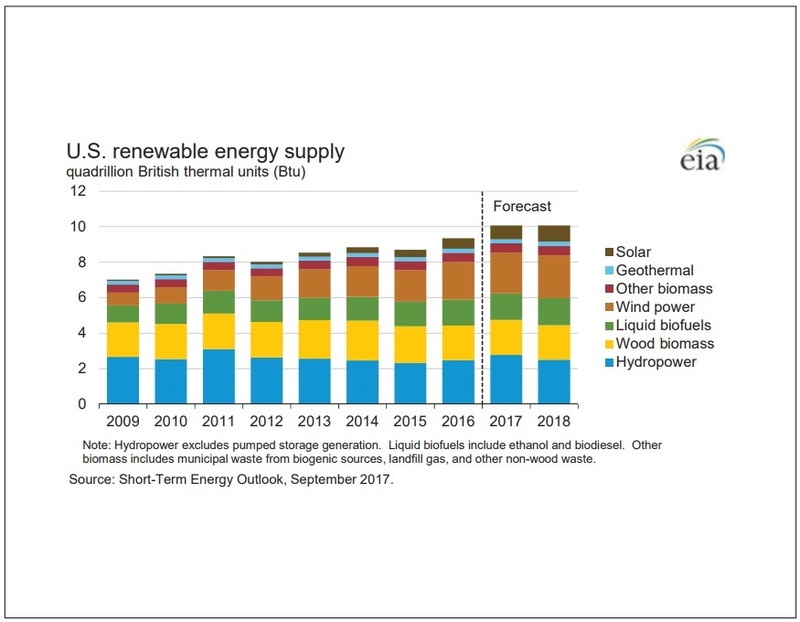 The U.S. Energy Information Administration has released the September edition of its Short-Term Energy Outlook, which includes updated forecasts for electricity production and generation capacity from wood and waste biomass. According to the EIA, the electric power sector is expected to have 7,414 MW of biomass power capacity at the end of this year, increasing to 7,599 MW by the end of 2018. Waste biomass capacity is expected to reach 4,211 MW by the end of this year, increasing to 4,303 MW by the end of next year. Wood biomass capacity is also expected to increase, from 3,202 MW this year to 3,296 MW next year. Biomass power capacity for in sectors other than the electric power sector is expected to reach 6,798 MW by the end of this year, increasing to 6,801 MW by the close of 2018. This includes 889 MW of waste biomass capacity in 2017, increasing to 89 MW in 2018 , and 5,909 MW of wood biomass capacity this year, increasing to 5,910 MW next year. The electric power sector is expected to generate 87,000 MW per day of electricity from biomass in both 2017 and 2018, this includes 49,000 MWh per day from waste biomass this year, increasing to 50,000 MWh per day next year, and 38,000 MWh per day from wood biomass this year, falling to 37,000 MWh per day next year. Other sectors are expected to generate 84,000 MWh per day from biomass this year and next year, this includes 74,000 MWh per day from waste biomass in both 2017 and 2018 and 9,000 MWh per day from wood biomass this year and next year. The electric power sector is expected to consume 0.280 quadrillion Btu (quad) of waste biomass this year, increasing to 0.287 quad next year. The sector is also expected to consume 0.229 quad of wood biomass in 2017, falling to 0.223 quad in 2018. The industrial sector is expected to consume 0.190 quad of waste biomass this year, falling to 0.188 quad next year. Wood biomass consumption by the industrial sector is expected to reach 1.271 quad this year, falling to 1.239 quad next year. The commercial sector is expected to consume 0.047 quad of waste biomass in both 2017 and 2018. The sector’s consumption of wood biomass is also expected to remain steady, reaching 0.078 quad this year and next year. The residential sector is expected to consume 0.386 quad of wood biomass this year, increasing to 0.413 quad next year. Across all sectors, waste biomass consumption is expected to reach 0.518 quad this year, increasing to 0.523 quad next year. Wood biomass consumption is expected to reach 1.964 quad this year, falling to 1.954 quad next year. SynTech Bioenergy Commences Installation of its first BioMax unit in Matsusaka Japan.